After months of speculation and alpha gameplay footage leaks, Polish games developer CD Projekt RED finally rolled out its official announcement for The Witcher 2: Assassins of Kings yesterday. Sequel to the bestselling fantasy roleplaying game The Witcher, it should ship sometime...well, sometime. The press release only confirms Atari will publish the game for PC in North America, though the design team says the game's been designed from scratch to eventually support console versions. Remember The Witcher? It dropped like a thunderclap out of the blue back in October 2007. I wasn't expecting much. Another European-themed PC-only medieval hack-and-slash? By a company previously known for doing localizations of other developers' games? Derived from BioWare's clunky Neverwinter Nights "Aurora" game engine? Can you blame me for thinking "turkey"? Except that it wasn't. And while CD Projekt RED didn't then (and still doesn't today) have the Western brand recognition of a publisher like BioWare, The Witcher was light years ahead of games like Baldur's Gate and Jade Empire and Neverwinter Nights 2, anticipating the whole gritty "HBO of RPGs" angle Dragon Age: Origins wouldn't attempt for two more years. Can CD Projekt RED pull it off again? We can hope. The game hasn't been outsourced (a good sign) and as far as I can tell, the same design team's running the show. Concerning story and theme, the press release confirms the sequel will remain "mature," while adding that it'll also be "non-linear," which is interesting, because The Witcher wasn't. With rare exception, your progress through the original game was measured in chapters tied to modular areas. Some farmland. A village. Part of a city. Another part of a city. Sewers. A swamp. (And so on.) You could sometimes transit between these, but for the most part, you ticked off quests and worked over each area before progressing to the next location without looking back. According to the press release, The Witcher 2 "is built upon completely new technology, designed from scratch by CD Projekt RED to develop role-playing games with non-linear plot." Maybe they're cracking the world open at last then? Giving the go-between area links more flex and long-range continuity? Hey, no need to go all Oblivion-kitchen-sink-crazy, guys, but more latitude to explore at leisure? Sign me up. Friends can be duplicitous cult members, guards are (shockingly) guilty of sexual assault, witches sell poisonous suicide solutions and craft voodoo dolls to compel siblings to kill each other, barmaids (and plenty others) will sleep with you for booze, religious fanatics turns out to be distastefully misogynistic, and for all the bosky monsters, the worst aren't the ones with ten or twenty consonants crowding a single vowel, but other humans, just like you. So yes, more of that too, please. One of the best aspects of The Witcher? It's combat system, which required timed clicks of the mouse to execute combos and let you select from upgradeable, visually elaborate fighting styles. Defeating enemies hinged on matching styles to enemy types. "Strong" sword-slinging worked great against tallish thugs, but did less damage to smaller foes. Likewise "Fast" jabs and slashes barely fazed jumbo combatants, but quickly crippled pint-sized pugilists. 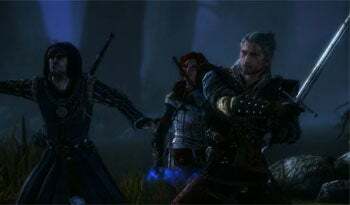 The Witcher 2's new combat system "smooths" those mechanics, while "guarantee[ing] a greater variety of tactical possibilities." CD Projekt RED says it'll demo the game publicly later today (check for video updates here, or view the official debut trailer here). The official website for the game debuts April 7. Follow Game On on Twitter.